The Double Helix Series was developed to bring out the warmth of the fundamental throughout the range of the 5-octave marimba. 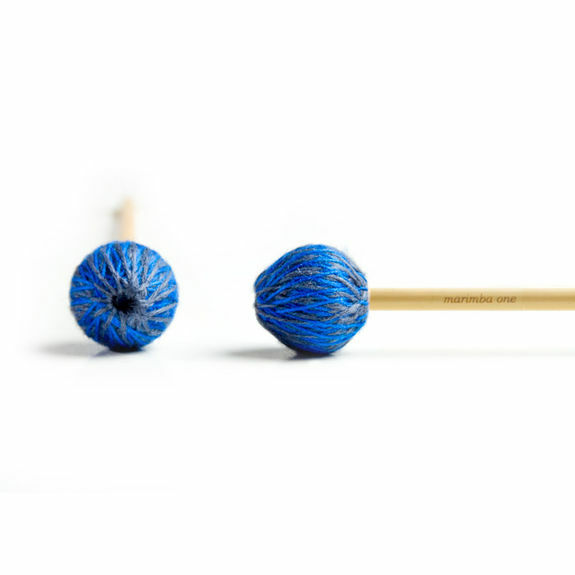 The relaxed yarn tension on these mallets enhances the smooth, dark attack of the mallet. The exclusive patent pending “double helix wrap” technique allows you to easily identify each mallet in the series. Two strands of yarn are wrapped independently of each other, creating a woven effect. After one of the strands makes a revolution around the mallet head, the other strand makes a revolution, securing the previous strand. This locks the yarn in place and prevents it from unraveling. This unique method of wrapping provides our mallets with their distinct look, and exceptional sound. Lynn Vartan discusses and performs with the Double Helix series of Marimba One mallets. Great sound out of these mallets and they are very well made. Right weighting for mallets and comfortable for 4 mallet holding. These mallets are excellent. Totally safe for the bottom end of a 5-octave. They get a little slappy/tinky about C5. LOVE THEM. These mallets are great for the intermediate player who is looking to expand their collection. Even though they're a little light for the lower register, with good technique and a little desire, they can speak well and cover a broad range. I suggest these mallets to most of my high school students. Absolutely amazing mallets to have. A little heavier than most other mallets, however, the beautiful sound produced by these mallets more than makes up for that. The mediums sounds great from C2 to about C5 and even a little over. Not to mention they a a beautiful look to them. I have almost the entire series and they are my go-to mallet for just about everything. These mallets are great! They eliminate that impact sound that most mallets make when you strike the bars. They sound the best when played in the mid-range of the marimba but also sound great at the low register. Overall the Double Helix mallets are a must for any marimba player! Great product!